We are manufacturers, traders, merchants and master potters from father to son. Everything started in Lyon when Pierre Revol and Magdelene Carrier, who came from two potter families, got married. The Drôme grounds had then very specific properties and offered all the resources needed to create a stronger and more resistant ceramic. The quality of the clays and sand, and more specifically the kaolin deposits, were the main factor in the manufacturing of the first REVOL clay. Pierre and Magdalene didn’t know that they were about to launch a company that would last all those years. 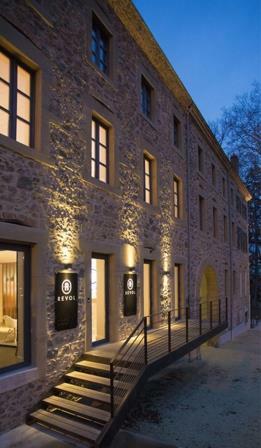 The REVOL saga was about to start: the 2nd generation of the family opens in 1800 a workshop in Saint-Uze. Soon, the workshop grew into a factory. The company is then specialized in stoneware that is known for being a very resistant material with hygienic properties. The company expands its success and exhibits many times in national fair trades during the second half of the 19th century. The company entered the twentieth century thanks to Louis Gustave Revol, who transformed the manufacturing process switching from an artisan manufacturing process to a more advanced technology - jiggering and slip casting. But the unforeseen coming of World War II impacted the economy and the factory infrastructures. Despite these difficulties, REVOL developed new markets: bistro business, alcohol and spirits bottles and invested in a new tunnel kiln and production capacities increased! In 1980, the 8th generation, Bertrand Passot (the family name has changed because of marital unions), took the leadership of the company. He began a rigorous restructuring plan: he invested in new machinery and trained the employees. He promoted and enhanced the know-how of the company and decided to improve the quality of REVOL’s clay by refining the firing process. From that point, the company changed to exclusively manufacturing porcelain and became Revol Porcelain. REVOL conquered the international markets with creations of a culinary range of products that combine both aesthetics and functionality. In 2000 Revol launched the Froissés collection. This little cup is a huge success and it becomes a cult object. Design and communication but more important, innovation (research and development), are at the center of the company’s strategy. Whether they’re developed in-house, like the Arborescence and Belle Cuisine ranges, or are the result of collaborations with designers and publishers – Succession or the new Caractere series – Revol products is in perpetual experimentation in the field of ceramics. REVOL has evolved from being an oven to table brand to a design oriented company now offering new dinnerware lines that would combine the quality of a professional use with the look of a cozy home-dining feeling. After 250 years, the factory is still firmly rooted in the undulating green landscape in the Drome. REVOL is proud to be at the top of innovation and design, equipping the most demanding kitchens, whether those of famous chefs or everyday cooks. Today, we have the same desire to bring out unique talents, bringing our products to the loveliest tables, with kitchenware and other cult objects and design pieces that embody art de vivre. In an era in which the pace of life seems to get faster and faster, Revol swims against the tide with unique products enabling tables that truly stand out from the crowd.